In addition to restoring the Great Wall mural (completed in 2011), SPARC will also be constructing a new solar-lit “Green Bridge” with interpretive stations, and constructing five additional stations along the wall to provide access to the historical content of the mural. For a detailed booklet about the Great Wall and the Green Bridge, Click Here to download the PDF. A newly designed replacement bridge (the previous deteriorated wooden was recently removed) will become a central public entrance and interpretive center about the mural and river. It will be outfitted with solar lighting panels and will provide an excellent viewing platform for the mural. Judy Baca and SPARC have collaborated with wHY Architects to complete the designs for a “Green Bridge” which will be composed in part from the debris of the Los Angeles River with interpretive panels along the expanse of the Bridge from which the public can view the river and the ½ mile of mural along its banks. A site plan, elevations for the bridge, materials, budget, schedule of construction have been completed for the bridge. A full model is built of the bridge and has been reviewed by County, and City department representatives. The new bridge will replace the former which crossed the Tujunga Wash Flood control Channel between Miranda Street and Hatteras Street on the west side of Coldwater Canyon Blvd. 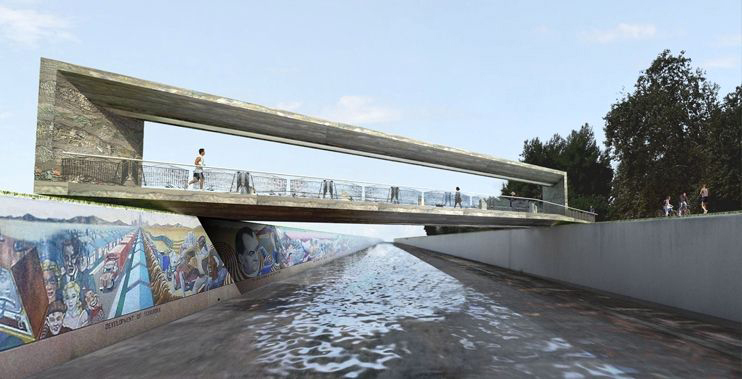 The new bridge will function, not only as a point to cross the Tujunga wash but also as a viewing station and interpretive center to view the Great Wall of Los Angeles mural and the Los Angeles River. The structure of the bridge will consist of prefabricated built-up plate steel girders, steel framing and new poured concrete footings. 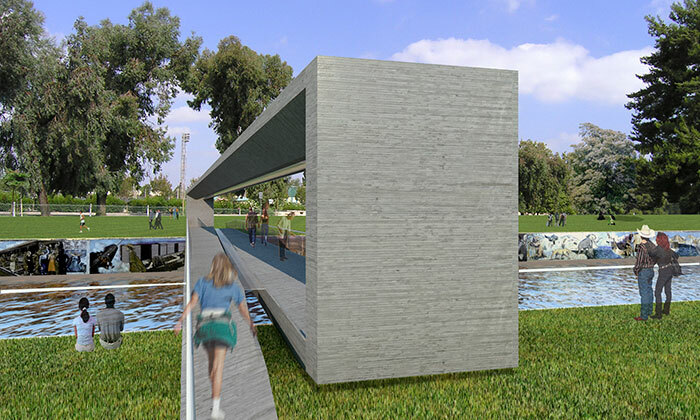 The finishing material will consist of prefabricated textured fiberglass concrete panels on the sides of the footbridge and canopy, and composite plastic impregnated wood decking on walk able surfaces. End panels will be troweled stone face plaster over steel framing with guardrails constructed of powder-coated steel for durability. The look will be one of layered sediment with broken glass, and other plastic debris common to the river. The roof of the canopy will consist of aluminum framed, clear glass panels with thin film photovoltaic strips. Photovoltaic cells will collect solar energy and distribute back to the department of water and power, monitored by PV meters. On the underside of the canopy will be a clear skylight finished with two layers of laminated polycarbonate panels with images of the river and the Great Wall silk screened on film and sandwiched between them. Light will filter through this skylight during the day illuminating the images. The total impact of the bridge will be that it will be an instructional site about the river and the history of the diverse people of Los Angeles while it reconnects the two sides of the channel.